There was a spirit of togetherness, mourning, and thought-provoking conversation, at UCF’s Rosen College of Hospitality on Friday, June 17, 2016, where the 5th Annual Florida LGBT-Allies Diversity Summit was held just five days after the Pulse tragedy took place. While the focus of the speakers shifted slightly to acknowledge the recovery from recent events, the event did also generate discussions and facilitate learning about inclusion of gay, lesbian, bisexual, and transgender employees in the workplace and catering to LGBTQ+ customers. Sarah King, Chair of the FLDC Board of Directors, conducted opening remarks for the summit. In light of the tragedy that was fresh on the minds of all in the room, especially since it directly affected the LGBT community, she passionately expressed her emotions as an ally, mother, business executive, and Orlando local about the incident and its effects. After Sarah King’s introduction, the half-day event continued in the form of a panel discussion that featured Ashley Brundage, PNC Bank; Cal Jackson, Tech Data Corporation; and Yvette Segura, USAA. Each panelist discussed different workplace best practices in regards to the LGBT community and how they are seeking to do even more to foster inclusion within their companies. After the panel, attendees moved onto the breakout session, during which they could choose between one of two workshops on the topics of “The ABC’s of LGBTQ+” presented by Ghenete Wright Muir or “Preparing Your Organization for Inclusion: Gender Transitioning in the Workplace” presented by Eduardo Suarez-Solar. Keynote Speaker, Arnold Evans, Central Florida Division President & CEO for SunTrust Bank, followed delivering a moving address about SunTrust’s response to the recent tragedy and the effects on the company. 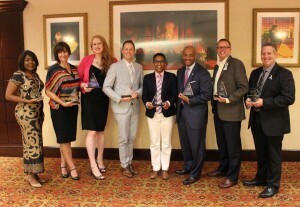 The event concluded with an awards portion recognizing key leaders and allies within the LGBT community across the state. The Florida Diversity Council would like to thank Wyndham Vacation Ownership, USAA, UCF Continuing Education, and for their continued support of this initiative as well as the dedicated event committee, speakers, volunteers, and attendees for helping to bring this event to fruition.